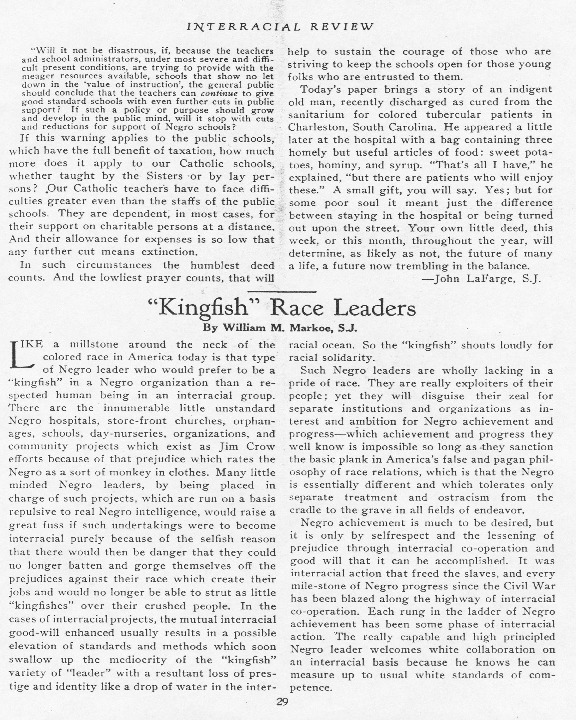 n his article (Kingfish Race Leaders,) which appeared in the February 1933 edition of the Interracial Review, Father Markoe expressed his opinion on activities intended to increase racial solidarity and on the leaders of such activities. This article provides an interesting contrast to the article by Father LaFarge on interracial activity. Though both priests ultimately favor interracial activity, their tone, reasoning and perception of racial solidarity differ greatly. Define "Kingfish" as it was used by Father Markoe. According to Father Markoe's perspective, why would a "kingfish" want racial solidarity? From this article, what can you deduce about Father Markoe's attitude toward racial action and interracial action? Explain whether you agree or disagree with him.